This post is oh…a few months late…we’d been too busy basking in the full glory of ALL. THE. PRODUCTS gotten for cheap cheap in Paris. The ground floor of Selfridges in London wasn’t bad either, but I may save it for another post. 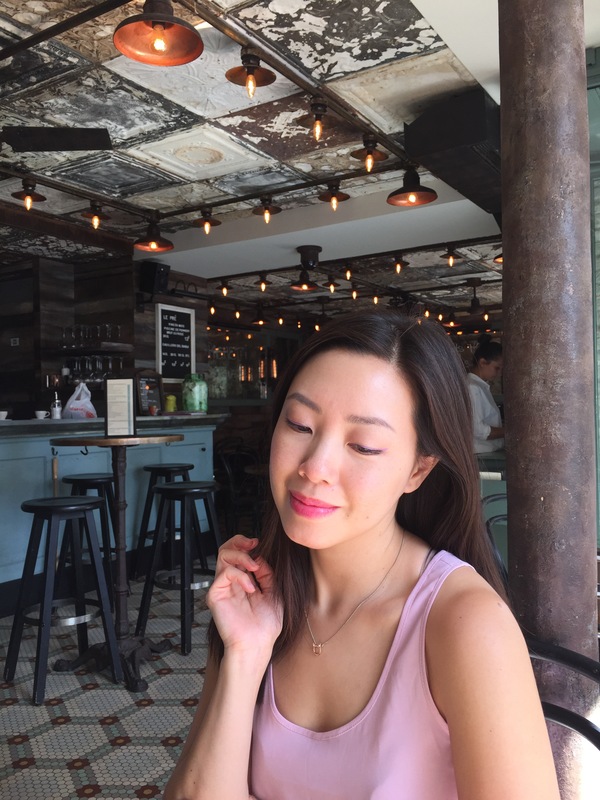 Behold a pic of Angela (who previously reviewed City Pharma but HAD to come back for MOAR) contemplating Caudalie for breakfast. Pictures ARE NOT allowed in City Pharma. Ahem. The very FAMOUS City Pharmacy in Paris ISN’T just a pharmacy. It’s the French beauty mecca on 26 Rue du Four boasting a seemingly endless inventory. All these coveted high end French brands are around 1/2 price (even after Euro-USD conversion) BEFORE VAT deductions. Europe prices include 20% VAT which you submit for refund back at the end of your trip. The above is considered a modest haul because I only brought a small backpack and duffel bag for a weekend in Paris. And most of what I got was travel-sized, for easier sampling of all the French offerings. 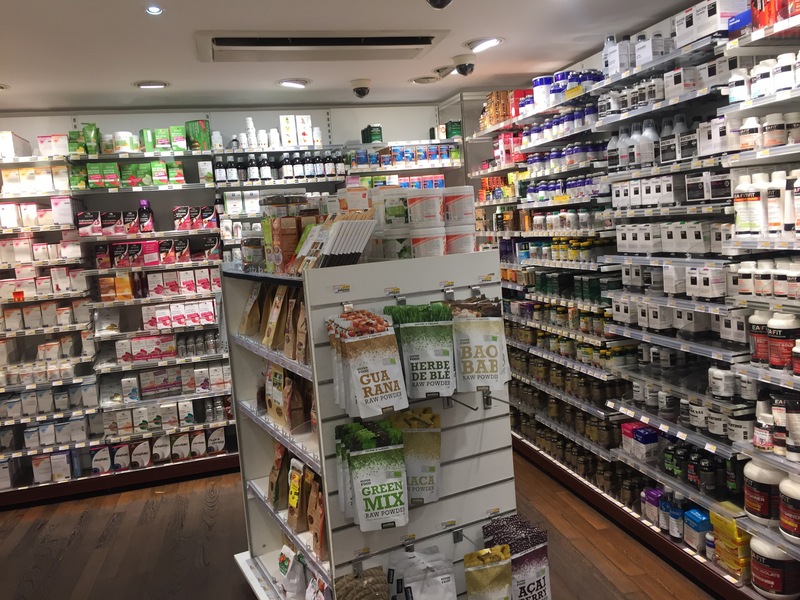 The shelves of the Rue du Four City Pharma was stocked FULL of goodies. 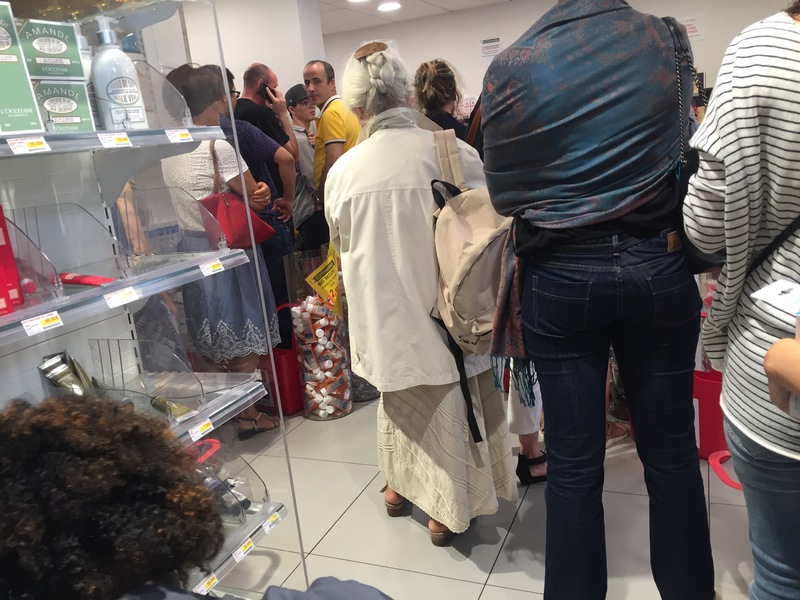 It’s the best inventory I’ve ever seen in a Parisian pharmacy (most French pharmacies are tiny, with very limited items) and I know people who spent 4+ hours at City Pharma on Rue du Four. Some newer products, such as the full Erborian line, was similarly priced as those items in the U.S. BUT we did see some items on sale for 50% off. And with the Euro being the lowest in years, it’s definitely still worth smugly obtaining. There were definitely things I haven’t seen on U.S shelves. 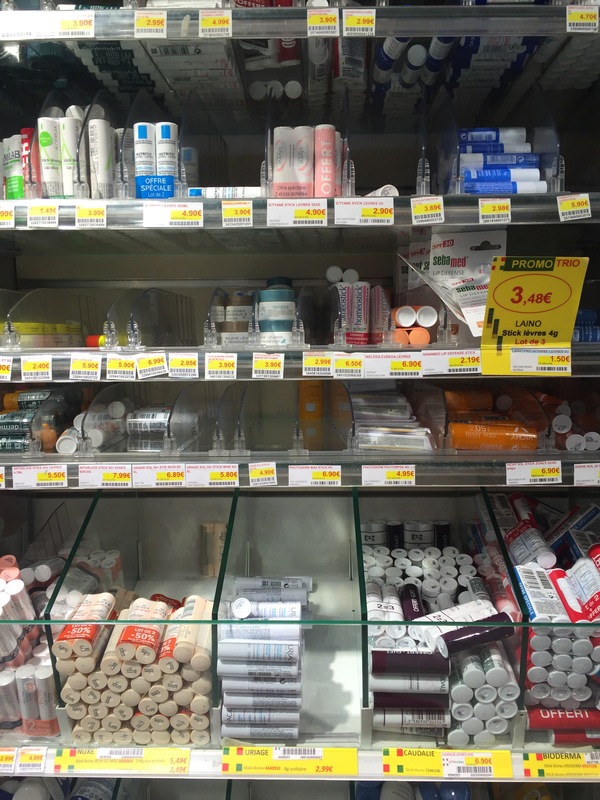 For lip balm addicts: one entire wall of City Pharma is packed with lip balms of every brand. And they have massive deals like buy 2 get one free. LOOK at the prices! The Caudalie lip balms are usually $12 EACH. Here it’s 6.90 Euros for THREE. The upper floor of City Pharma is where you can get vitamins and supplements. 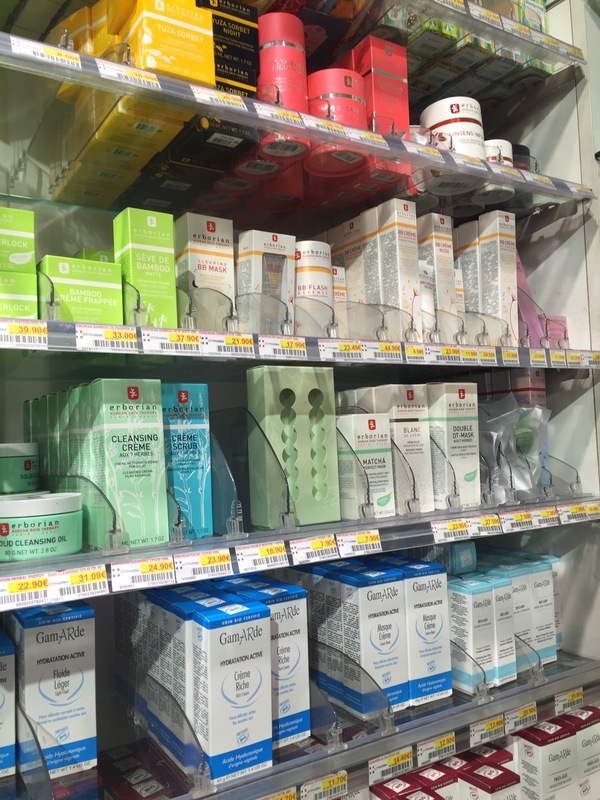 It’s also where the pharmacist counter is, so you can go get Biafine (sorta like an all purpose healing balm for things like sunburn and scars) and Avibon (a now-discontinued Vitamin A pomade that’s legendary as a night mask). 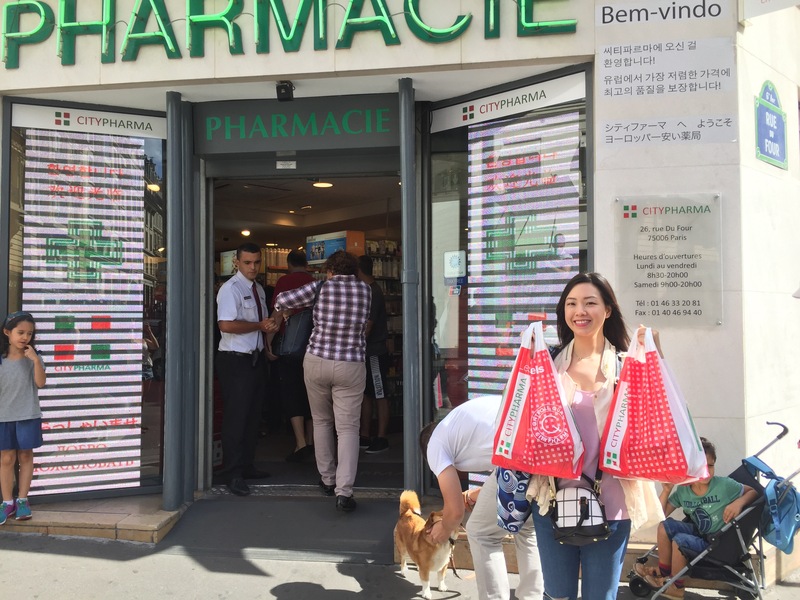 The pharmacists all around the store, thanks to the increased tourist traffic, are more helpful than the typical Parisian. I gtf outa there in 1.5 hours. The lines can get very long if you’re not there in a timely manner (before 10AM). I spent 1 hour shopping and about 20 minutes in line. If you want to fill out the VAT form to get your 20% tax back, remember to bring your passport. I forgot mine but managed to convince them to do it anyway, but only because I memorized my passport number. If you come on the weekend (they’re CLOSED Sundays btw) or late afternoon, be prepared for a longer wait. Below is Angela boasting two bags of goodies. Notice how tourist-friendly they have become. Also, the space is tiny, but it’s filled to the brim with goodness and wonders. I mean, I might even skip the Louvre for this. True fking story. And below, below, is a picture of Angela gratuitously posing in Cafe le Pre which had one of the best daily special spaghetti bolognese we have ever had. How cute is this place? Pros: everything about City Pharma is the stuff of dreams and fantasies for the beauty lover. My second fave is Pharmacie des Archives on 2 Rue des Archives. Cons: well, if you don’t live in Paris, City Pharma is sort of a hike. But you should make it happen. OMG you have to! It’s one of the beauty wonders of the world lol. I will review the stuphs shortly. HO. LEE. CRAP. That looks AMAZING! OK, add to the bucket list. Shopping at City Pharma in Paris. It reminds me of shopping at H&M in Barcelona before H&M hit the States. I made out like a bandit and felt like a wealthy foreign tourist. I LOVE feeling so smug at obtaining amazing bargains that are out of the reach of your friends back in the States. That’s like, one step above finding an amazing bargain in itself. The thrillllllllllll of it..lol. And yassss…..I felt like a lotto winner. Ugh this is amazing! I’m going to Italy soon so I’m definitely going to try and make a trip to Paris just so I can go here, the lip balm shelf is calling to me. Did you end up going????? So glad that you had fun in my adopted city! 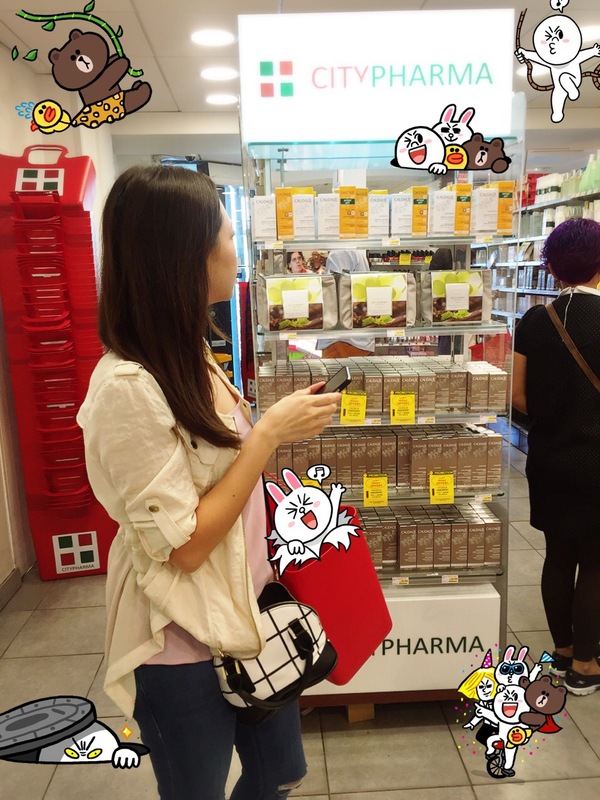 I would also reccomend checking out Phamacie Monge ( Place Monge, line 7) you have to price compare but in general they compete with citypharma and tend to have cheaper prices! It is smaller than citypharma, make sure you get there before the tourist buses.